It’s a wild carnival that travels across the country, selling speed as the salvation for all that ails. It’s a world of split-second life-or-death decisions, where huge egos clash on the track, and where old country ways are disappearing into a mega-money hustle of big-city sports. It’s the fastest growing sport in America, spawning idols like Jeff Gordon and Dale Earnhardt. 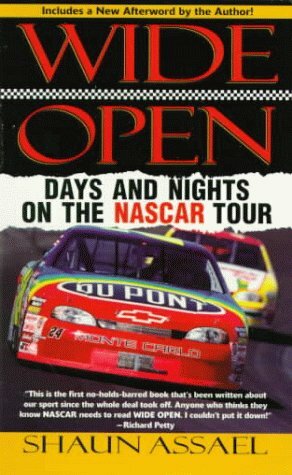 It is NASCAR Winston Cup Tour. 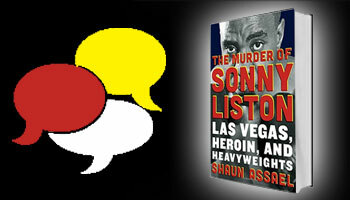 . .
Now ESPN Magazine writer Shaun Assael takes us behind the scenes, into the pits and onto the tracks, chronicling the days and nights of Americas fastest soap opera. Secrets don’t keep long, he writes, but they don’t have to. Everything changes fast in the speed world. Wide Open looks at one full year on the NASCAR circuit as it has never been examined before. This extraordinary book examines the life, the loves, the blood feuds of the stars, the grunts, the drivers, the mechanics, the wives, the girlfriends, the moneymen–everyone and anyone who makes things happen. Assael chronicles the travels of three particular racers–Bobby Hamilton, Dave Marcis, and Brett Bodine–as they struggle through a thirty-one-race season. He takes us on the political campaign trail with Richard Petty, into Flossie Johnson’s kitchen where she tells what it was like to live with and be left by the legendary Junior Johnson, and into the fascinating and heartbreaking realm of Bobby Allison’s broken dreams. Wide Open is a funny, tragic, dramatic journey inside a world that has long been closed.